NOTE: The John Lewis version is more money, as it comes complete with the tracking motors, the others do not. For views of the brighter deep space objects like galaxies and nebulae, we recommend the larger aperture and light gathering ability of the Newtonian reflectors such as this one. The Celestron 130EQ Astromaster comes with a StarPointer which makes it easy to find any object, a lot easier than with a traditional finderscope. 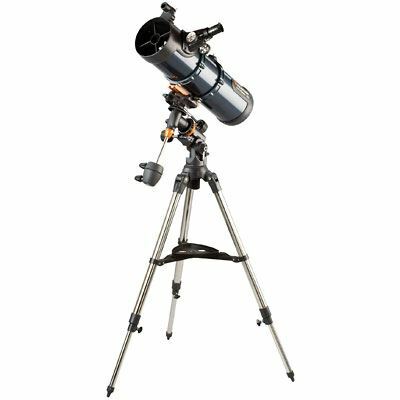 The Celestron 130EQ Astromaster is quick and easy no-tool setup, it has a permanently mounted StarPointer, has Erect image optics – Ideal for terrestrial and astronomical use. It also has a German Equatorial mount with Setting circles – to accurately locate and track sky objects. The tripod is a rugged pre-assembled tripod with 1.25″ steel tube legs – Provides a stable platform, this is something that is very important when viewing distant objects.